Why did Gordon Brown struggle to find success as Prime Minister? 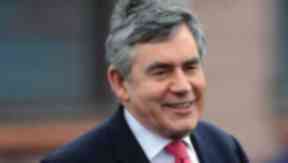 Edinburgh Fringe play The Confessions of Gordon Brown examines what makes the MP tick. A play which premieres next month at the Edinburgh Fringe examines what made Gordon Brown tick and why, despite his vast experience, he struggled as Prime Minister. It was a job the son of the Manse, raised in Kirkcaldy, had coveted all his life but a year after coming to power the global financial crisis began and his premiership began to unravel. In the play The Confessions of Gordon Brown, which opens in Edinburgh at the end of next month, Ian Grieve takes the role of the former Prime Minister reflecting on his past. Playwright Kevin Toolis joined Daily Mirror associate editor Kevin Maguire and former STV political editor Colin MacKay on Scotland Tonight to discuss the issues. Download: The STV News app is Scotland's favourite and is available for iPhone from [the Apple store] (http://itunes.apple.com/gb/app/stv-news/id369121433?mt=8&ign-mpt=uo%3D6) and for Android from [Google Play] (https://play.google.com/store/apps/details?id=tv.stv.android.news). Download it today and continue to enjoy STV News wherever you are.